Consequently, the Resurrection is the style of life of an Orthodox Christian. According to this style of existence, man, being faced with various life circumstances, consistently rises and constantly moves forward. Living this cross-raised atmosphere, the Church endlessly rushes towards the meeting of the future: the encounter with the Risen Christ. However, beyond the catholicity of the Church, where resurrection truly manifests itself, and therefore, we see that the celebration of the Resurrection takes place in the framework of folklore and customs when beyond unity. As a mere imitation, as Aristotle said. It is truly a tragedy that some people experience the Church as a tribal synagogue, as an ethno-club, while the Church, by its nature, has never founded itself or will ever be based on one’s political will to organize national celebrations of the supranational Resurrection of Christ! The Church is not an organization! It is, as Fathers said, Christ Himself extended throughout the centuries. I said and repeat, the Church is not founded on political desires and decisions, but on the Incarnation and on the Cross and Resurrection of Christ. Resurrection is the permanently new look of our lives! In this country, the only way to explain the existence of our local church are the following two words: Christ is Risen! So today, celebrating the Resurrection we celebrate the invincible power of God. Someone may ask who we are? There is a man sent from God, whose name is John, the Archbishop of Ohrid. He came to testify that the catholicity of the Church is our resurrection. There is a race of Christ in the Ohrid Archbishopric, and all belonging to this race have been given authority to be children of God. But due to aforesaid, the Prelate suffers imprisonment and others are in the worldly courts of the earthly potentates. The persecution of our Archdiocese is in essence an escape into fictional reality of the persecutors having nothing in common with the reality of the Resurrection. Therefore, for people who persecute the Church, everything ends with death. Without the catholic point of view from the Resurrection, existence becomes a workshop of death. Only the Catholic Eucharist is a workshop of life. The true meaning of Resurrection is in fact restoration! 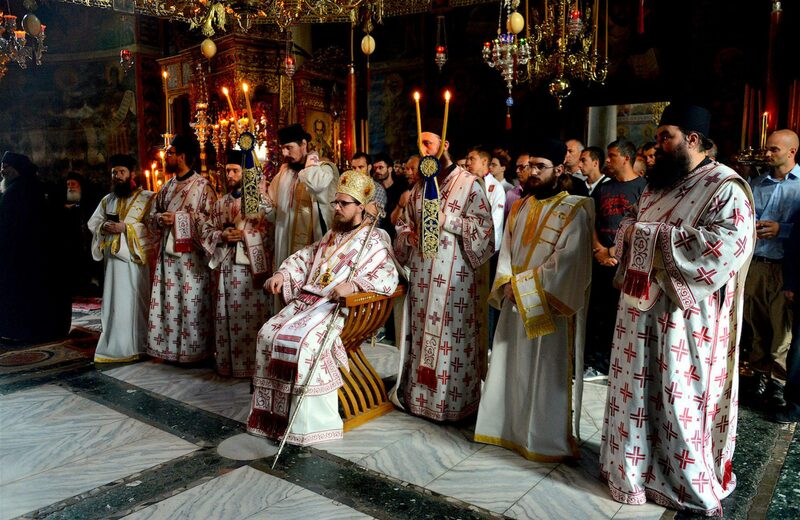 That is why exactly the Orthodox Ohrid Archbishopric testifies it, and it is the very Resurrection in our country, as its Prelate has established its unity with the One, Holy, Catholic and Apostolic Church! However, let us always show understanding to our schismatics, for it is too easy for them to say: let us persecute the Church, because it stems from their separate celebration of the Resurrection as a folk custom! Today, many see the mentioned persecution and perceive from where this Resurrectional joy of ours springs and constantly gladdens us! The world that names this persecution as a torture of religious freedom. The Church recognizes confession of the faith in the suffering of persecution! Some make efforts to end it, others are unable to do so, third ones watch with anticipation, but no one is indifferent. Except those who are acting the role of indifference! However, we discover the Risen Christ in the faces of all the people. Let us always forgive everything, exactly because of the Resurrection, so that we constantly find each other in the liturgical assemblies as we do now, the assemblies that represent the end of world’s impasses, and are home to the fullness of the manifestation of the Risen Lord, so accepting His Body and Blood as staging for life eternal, let us chant and sing incessantly: CHRIST IS RISEN! Previous PostPrevious Епископ стобијски и Местобљуститељ струмички Давид: Христос Васкрсе! Next PostNext Ο Επίσκοπος Στοβίων και Τοποτηρητής Στρώμνιτσας Δαβίδ: Χριστός Ανέστη!